= Eriosyce taltalensis var. floccosa (F.Ritter) Katt. Altitude: 300-600 metres above sea level. Habitat and Ecology: It is found in inaccessible areas in the coast and into the nearby hills (lomas costeras) mainly on rock crevices in cliffs and in rocky slopes. The species is very scarce but seems stable. Illegal collection is the only major threat. Description: Eriosyce taltalensis var. 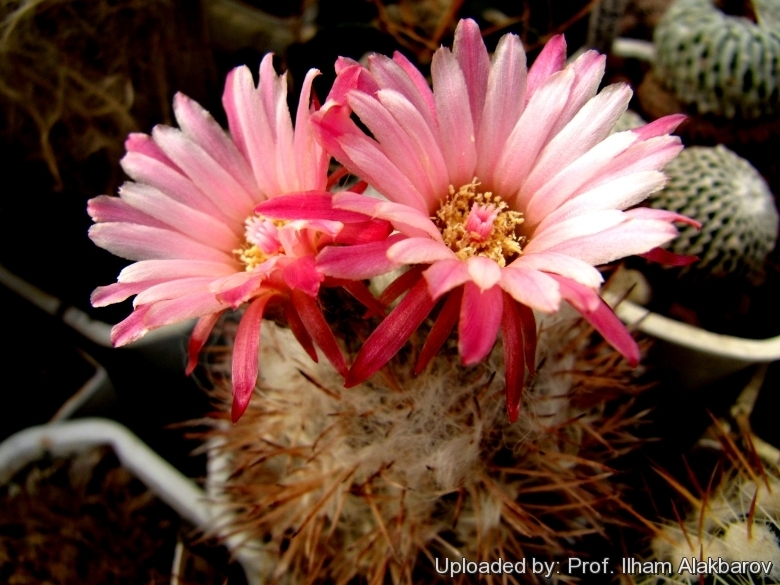 floccosa (still known in cultivation with its old names Neoporteria floccosa and Pyrrhocactus floccosus) in general form is reminiscent of a Eriosyce taltalensis subs. echinus, but the stem tips is covered by long tufts of wool. Remarks: The woolliness is greatly influenced by the conditions of culture, at lower light levels the white wool is scarce, while with strong solar radiation the woolly flocks are stronger with a yellowish tint. Furthermore heavy water from beyond flush out the wool, and also the woolliness increases gradually as the plant ages. Though plants with heavy wool covering are somewhat characteristic of this variety, woolly specimens occur naturally throughout Eriosyce taltalensis range, and can be encountered in many cultivated specimens. With the exception of the existence of the heavy wool covering, all the other characteristics are very similar with standard Eriosyce taltalensis subs. echinus, namely size and form of stems, roots, flowers, fruits etc. Habit: It is spiny geophytic cactus with solitary (or sometime branching) stems rising barely above ground level (in habitat). It shows a certain degree of variability depending on origin. Stem: Globose or semi-globular to elongate (especially in cultivation) 6-15 cm in diameter and 5-8(-15) cm tall, dull dark green, in the sun often tinged with purple. Roots: Fibrous, arising from a short, conical taproot. Ribs: (8-)10-13(-16) vertical, forming tubercles with chin-like protrusions. Areoles: Sunken, with creamy-white or yellowish felt or wool. Spines: Spines variable, tannish-brown, dull grey-brown or black, somewhat glaucous except at apex turning chalky white or grey as they ages, straight to curved. Radial spines: 6-12(-20) thin, more or less curved or twisted intergrading with the centrals 3-20 mm long. Outer radials spines (6 to 12 ) often flexuous, straight; Inner radial spines (6-12) thicker more rigid. Central spines: 1-4(-6) straight or barely curved, rarely somewhat obscurely hooked at the apex, usually 3 cm. long, rarely up to 4 cm long, otherwise similar to inner radials. Flowers: Closely packed apically in top 2 or 3 young areoles areoles of a rib, one flower to an areole, narrow to broad funnel-form or campanulate, 3-4 cm long, 2-3 cm in diameter or larger, fuchsia-purple, pink, pale yellow, creamy white to white. Pericarpel and tube very short (less than 2 cm long on the whole) with scales producing white woolly hairs and few twisting tan bristles up to 1 cm long in the upper pat of the tube. Tepals lanceolate up to 1,5 cm long, 2 to 3 mm broad, entire, uniformly coloured or slightly lighter near margins, outer segments darker and merging with brown and green tube scales almost black apically. Stamens numerous about 8 mm long, fuchsia purple, whitish at the base, anthers and pollen yellow. Style stout, fuchsia-purple 15-17 mm long, 1,5 mm in diameter in the middle, stigma lobes fuchsia purple about 3 mm long. Blooming season: It has several flush of flowers in sequence at different times over an interval of several weeks from late spring/early summer to autumn, with heaviest flowering early and late in the period of time. Fruits: Elongate red, a bit hairy, with seeds loose within, dehiscing by basal pores. Delaetia woutersiana Backeb. : has bristly more or less tortuous spines (= Eriosyce taltalensis subs. paucicostata). Distribution: Antofagasta? Delaetia woutersiana cv. Thin Petals (Backeb. ): is an odd (monstrous) cultivars with very fine petals, cut into shreds. The flowers look quite different, but nice and bi-coloured, yellow and orange-red. Eriosyce cachytayensis hort. : Possibly a synonym of Eriosyce taltalensis, Erisyce paucicostata or Eriosyce neohankeana. Origin: Unknown. Eriosyce eriocephala (Backeb. ): It may be recognized for the long white hairs under the flowers (particularly conspicuous in mature flowering specimens). Eriosyce intermedia (F.Ritter): Smaller form very similar, if not the same, to Eriosyce taltalensis var. pygmaea. Distribution: Chañaral. Eriosyce pulchella (Backeb. ): Smaller form with white to pink flowers. It is not easily distingushable from Eriosyce taltalensis var. pygmaea. Distribution: Chañaral to Caldera. Eriosyce taltalensis (Hutchison) Katt. : (subsp. taltalensis) it is a variable species that has straight spines, red, pink, cream, or white flowers, and comprises two varieties. var. taltalensis has red or cream flowers; var. pygmaea has white or pink flowers. Eriosyce taltalensis subs. echinus (F.Ritter) Katt. : is a fiercely spined species, that has flowers white below, fuchsia red above, and comprises two varieties. var. echinus has stem tips with short wool; var. floccosa has stem tips with long tufts of wool. Eriosyce taltalensis var. floccosa (F.Ritter) Katt. : has stem tips with long tufts of wool. Eriosyce taltalensis subs. paucicostata (F.Ritter) Katt. : has grey-blue or grey-purple stems often cylindrical 6-8 cm in diameter and 15-30cm long with only 8-12 ribs. Flowers pale pink, cream-white or pale yellowish. Eriosyce taltalensis subs. paucicostata f. viridis (F.Ritter): The “viridis” form has grass green bodies with 10-13 ribs (whereas the standard form generally has grey-blue-green or grey-purple tinged stems) . Eriosyce taltalensis subs. pilispina (F.Ritter) Katt. : has twisted spines and white flowers. Eriosyce taltalensis var. pygmaea (F.Ritter) Katt. : has smaller stems and distinctive pale white to pink flowers. Distribution: North of Chañaral. 4) "Succulent Plant Research" Volume 1, David Hunt, Richmond 1994, page. 117. 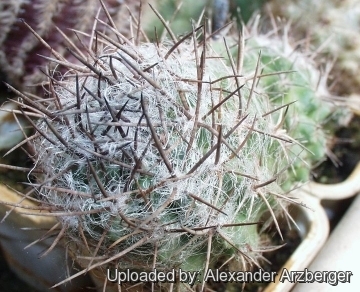 6) Hutchison, Cactus & Succulent Journal of America (Los Angeles) 27: 181-182 1955. 7) Guerrero, P., Faundez, L., Saldivia, P. & Walter, H.E. 2013. Eriosyce taltalensis. In: IUCN 2013. "IUCN Red List of Threatened Species." Version 2013.2. <www.iucnredlist.org>. Downloaded on 06 January 2014. 8) Faundez, L., Guerrero, P., Saldivia, P. & Walter, H.E. 2013. Eriosyce paucicostata. In: IUCN 2013. "IUCN Red List of Threatened Species." Version 2013.2. <www.iucnredlist.org>. Downloaded on 07 June 2014. Cultivation and Propagation: Eriosyce taltalensis var. floccosa is a slow growing but relatively easy to grow species, providing they are kept dry during autumn and winter and rot prone if kept in a non ventilated place. Soils: Require a very fast mineral draining drying soil (70-80% grit and 20-30% of land soil). To prevent rottenness it is also advisable to surround its root neck by very rough sand or grit, this help a fast water drainage and an appropriate air circulation. Watering Needs: Root prone it needs good drainage, waterings should regular in summer (do not overwater), to keep the plant compact and not become excessively elongated and unnatural in appearance. During the winter quiescent period, or when night temperatures remain below 10° C, it must be strictly kept dry since it is very sensitive to any moisture excesses. Fertilization: During the beautiful season it’s good to enrich the soil using a fertilizer rich in potassium and phosphorous, but poor in nitrogen, because this chemical element doesn’t help the development of succulent plants, making them too soft and full of water. Exposure: Requires strong sun exposure to develop good spinal growth (maximum brightness, sunlight accepted), but tolerate light shade. Some light shadow my be useful in the hottest summer days. Frost Tolerance: Hardy to at least -5°C for a short period but cannot tolerate long standing freezing temperature, and for an healthy cultivation ensure a minimum temperature of 5° C. Assure a good ventilation. USDA Hardiness Zone 9b and 11. Heat tolerance: Good heat tolerance, but in warmer climates it should be protected from excessive heat and too much sun sun in summer. Maintenance: Repot in the spring, when its roots become cramped. Generally, it should be repotted every other year in order to provide fresh soil. After repotting, do not water for a week or more. Propagation: Usually propagated from Seeds. (seldom produces offsets). Sow the seeds in spring in a well-aerated compost at a temperatures of 22-24°C . Stand the pots in water, moisten thoroughly and drain. Scatter and press lightly the seed onto the top of the compost. But do not cover the small seeds with compost. Secure a polythene bag around the pot or cover the container with glass or and place in a warm shaded place. If possible, germinate in a propagator. Some seedlings may appear within a week or 10 days others will take longer. At lower temperatures, germination usually takes considerably longer. Once germination has taken place, remove gradually the glass or plastic and move into a good light but not in direct sun. If the young plants are exposed to too much sun, or the compost dries out, they may stop growing and often turn red; once they stop, it is often difficult to persuade them to start growing again. Never let the pots dry out-but don't saturate them either. A sodden compost is as harmful as a dry one. The seedling growth is rapid. But the seedling are often grafted because the plants on their own roots (especially the bigger ones) are extremely prone to root rot. In fact the best and older specimens are the grafted ones.